Ages 13 through 18. 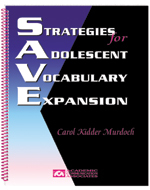 The activities in this book are designed to help junior and senior high school students with language deficits acquire strategies for learning and using vocabulary more effectively. Challenging, high-interest activities are included in which students talk about the meaning of words in short stories, interpret sentences, compare alternative word meanings, reformulate sentences using precise vocabulary, etc. Reproducible worksheets are included. Comprehension Check. The questions in this section are used to determine if the student comprehends basic facts from the story. Vocabulary Expansion. The student is asked to define words presented in the story, to use these words in sentences, to compare word meanings, and so forth. Thinking Questions. In this section, the student is asked to respond to thinking questions relating to the information presented in the story. The passages provides opportunities for students to experience new vocabulary in contexts that are interesting and relevant to classroom learning. The book targets thinking and problem-solving skills commonly emphasized in state academic standards. Reproducible worksheets are included.